The 2012 Toronto Audio Video Entertainment Show (TAVES) took place September 28-30 at Toronto’s King Edward Hotel. SoundStage! Network founder Doug Schneider and I provided online coverage of all three days of TAVES, which ended up being a bit of a letdown in terms of seeing new, reasonably priced, high-performance gear. That said, I saw and heard several relatively affordable loudspeakers that deeply impressed me. Each retails for under $2000 USD per pair and is available now. First was KEF’s LS50 minimonitor, a nicely appointed coaxial bookshelf speaker whose sound far exceeded its diminutive stature and price ($1500/pair). Doug had raved about the LS50 after hearing it earlier this year, at the High End show in Munich, Germany. While I generally trust Doug’s impressions of equipment, I just couldn’t believe that a $1500 pair of speakers could be that impressive. 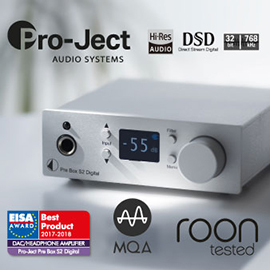 After hearing the little guys in Audio Excellence’s room at TAVES, I can confidently say that they’re terrific speakers. Armed with a single coaxial driver comprising a 1" aluminum-dome tweeter and a 5.25" aluminum-magnesium-alloy midrange-woofer, the LS50 relies on technology trickled down from the British firm’s Blade ($30,000/pair). And I’ll be damned if the matte-black LS50 didn’t sound lovely. Whereas many bookshelf models, and even some small floorstanders, can sound a bit thin and anemic, the LS50 sounded robust, offering surprising bass for its size. Moreover, it sounded pure, with a shocking amount of clarity on tap. 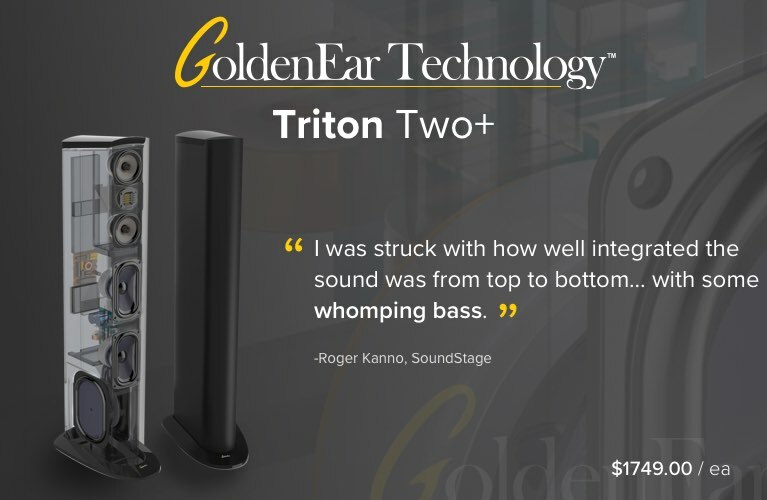 I’ve spent a great deal of time the past few months with several floorstanding speakers costing between $1200 and $2200/pair, and none of them sounded as clean and effortless through the midrange and treble as did the tiny KEF. While the LS50 couldn’t play deep bass per se, its claimed low-end extension of 47Hz, -6dB, sounds plausible. For a room of small or medium size, I’m not sure you can do better for the money -- which is probably why Doug Schneider has requested a pair for review. Until the TAVES show, I had never heard a pair of Magnepan speakers. Over the years, however, I’d gotten the distinct impression that the US company has something of a cult following. After hearing their Magneplanar 1.7 ($2000/pair), I can now fully appreciate the virtues of skinny ribbon speakers. Unlike MartinLogan’s electrostatic panels, used to strong effect in their ElectroMotion ESL ($2200/pair), which I lived with for several months and recently reviewed, the Magnepan 1.7 makes use of thin-film aluminum foil mounted on a Mylar substrate and suspended in a magnetic field. 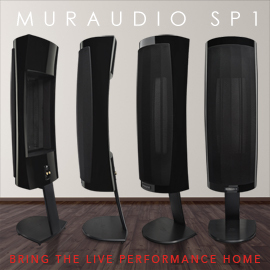 Also unlike the MartinLogan, which augments its electrostatic panel with a traditional cone woofer, the 1.7 uses only this ribbon material in its supertweeter, tweeter, and midrange-woofer. The Maggies sounded exceedingly quick and clean in the Audio Excellence room, delivering a sound very reminiscent of the ElectroMotion ESLs’ -- open, extended, effortless -- while demonstrating the characteristics of dipolar dispersion: moving my head from side to side dramatically changed how I perceived the music being played. This tendency of the 1.7 to "beam" may suit some listeners less than others. What differentiated the Magnepans from the MartinLogans was their delivery of bass. The ESL’s passive 8" driver never quite integrated with its electrostatic panel to deliver coherent sound from bottom to top. 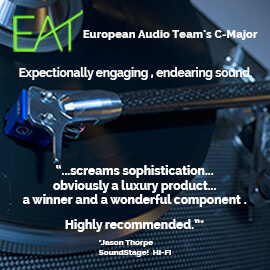 Compared to the ESL’s superb treble, its bass always sounded a bit bloated and ambiguous. 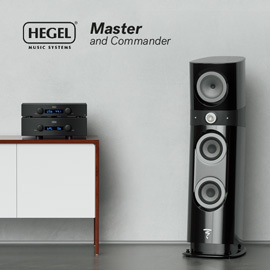 The Magneplanar 1.7, on the other hand, delivered tuneful bass and plenty of it, down to a claimed 40Hz. While room gain might have helped the Maggie sound a bit fuller than it actually was, its ribbon-created bass was decidedly more composed -- and for $200/pair less than the ElectroMotion ESL. If your amplifier puts out at least 100Wpc, the Magneplanar 1.7 would be a terrific way to get near-full-range sound for a pretty modest sum. France’s Cabasse was demonstrating their CinéOle 2.1-channel speaker system ($1800), and at first I paid it short shrift. As I listened, though, I really began to like what I heard. The subwoofer cabinet houses an 8" driver, a built-in digital-to-analog converter, and three amplifiers: a 25W amp for each of the satellite speakers, and an 85W amp for the sub. Inputs on the rear of the cabinet are of the RCA and optical varieties. The satellites’ magnetic grilles shroud a coaxial driver comprising a 0.75" tweeter and a 5" woofer, and the system’s frequency response is specified as 35Hz-22kHz. Included is a universal remote, a very small, wired infrared module, and all the cables you’ll need. Despite its "lifestyle"-product appearance, the CinéOle system produced a sound that was big and rich, but also provided a goodly amount of detail and clarity. Perhaps more surprising was the degree of integration of the outputs of satellites and subwoofer -- their collaborative effort sounded like a coherent whole, not two anemic minimonitors partnered by a generic, plodding sub. Although $1800 is a fair bit of cash, the CinéOle would make an excellent companion for bedroom or living room. Available in black or white, it’s as easy on the eyes as on the ears. And considering its multiple inputs and Auto Standby feature, it would work well connected to a TV and a musical source. Convenient, that. We have requested a set for review. It seems that the high-end industry is beginning to focus a bit more on reasonably priced products. 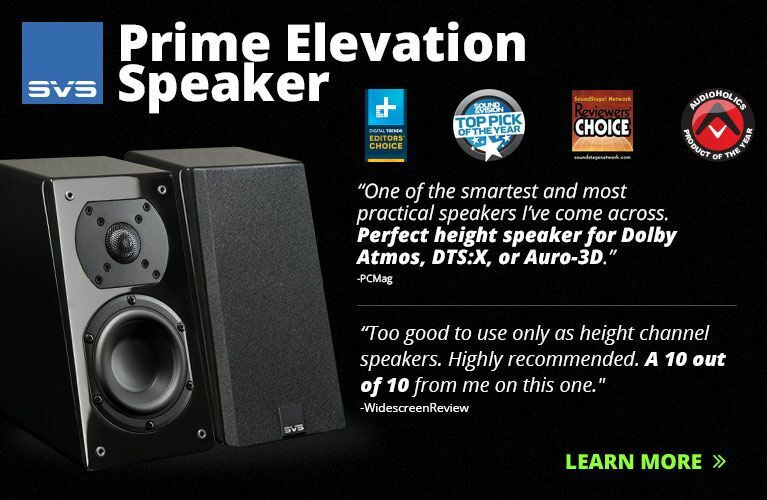 Although the above speaker designs are untraditional from an audiophile perspective, each works well in its own way. Based on the SoundStage Network’s coverage of the more recent 2012 Rocky Mountain Audio Fest, held October 12-14 in Denver, Colorado, there’s even more to look forward to. Italian speaker designer Sonus Faber announced their Venere line of speakers, which includes the Venere 2.5 floorstander. That gorgeous design retails for $2500/pair -- a paltry sum for Sonus Faber. 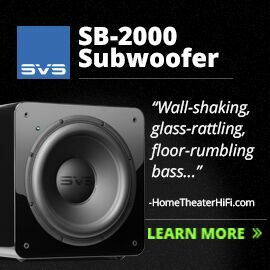 Perhaps an even better value is SVS’s Ultra Tower ($2000/pair), a floorstander with a midrange-tweeter-midrange array on its front panel and two 8" woofers, the latter mounted opposite one another on each side of the cabinet, in a fashion similar to that of KEF’s Blade. GoodSound! expects to soon receive review samples. The future looks good for the large numbers of us who lust to own gear from some of high-end audio’s top names, but can’t afford, or justify, paying some of the prices.